Ornamental 2012 – Click to embiggen. I waited until today to set up the Christmas tree, partly because of the funk I’ve been in all week (I think it’s a little bit because it’s been so warm) and partly because there were other things that had to be done first. So tonight, while my husband was winging his way back from a week at corporate headquarters in Boca Raton, a young friend helped me set up our 7’5″ pre-lit (with lovely white LEDs) Christmas tree, and then we unwrapped all my ornaments. 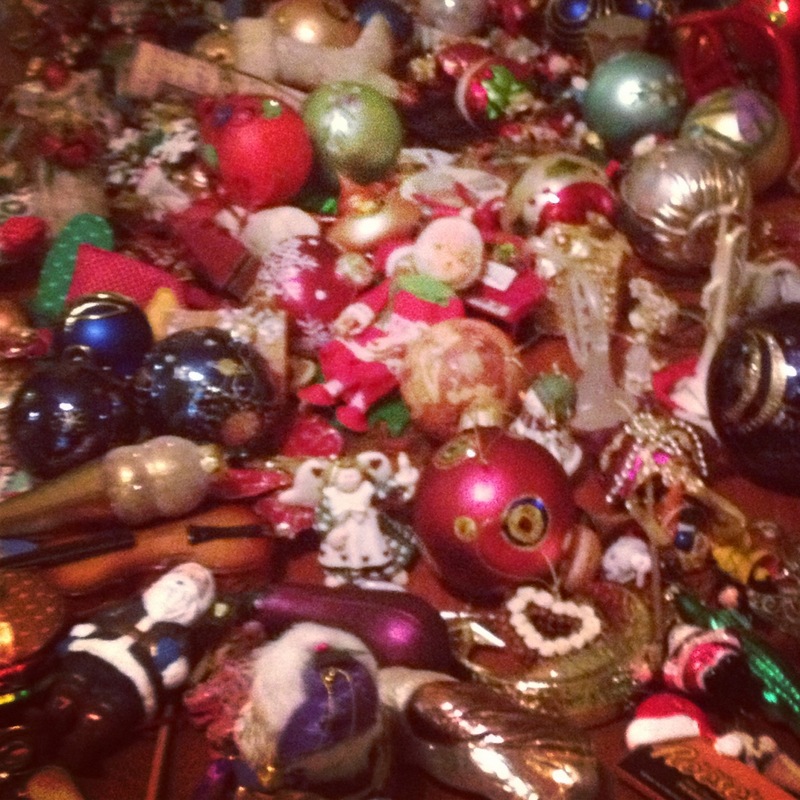 My ornament collection was started before I was born, and has continued to grow. I don’t have an exact number, but I know when things are missing, or broken, and I recognize every piece. Every ornament has a story, and I remember the cadence of my mother’s voice telling me each tale as we unwrapped and hung them every year. “This one was from your first mobile,” she’d tell me, gently caressing a yellow-painted wooden piece. “And this one was on one of your first packages,” she’d say, showing me a bunny tucked into his walnut-shell bed (with pink gingham sheets that were just like the ones I had as a child). Every year, until I moved out of her house, the ritual was the same. My mother still reminds me that one of the most difficult things she’s ever done was packing my ornaments separately from hers the year I got married. Imagine then, my devastation when, upon opening one of the two giant rubber tubs full of carefully wrapped Christmas treasures, I noticed odd pink staining on several of the white tissue-paper wrappings. Even worse, as I pulled more packages out of the box, was the pervasive odor of mildew, and several packages stained brown as if they’d been drenched by something unmentionable. “I’m going to cry,” I told my young helper, as I peeled still-damp paper layers from around a set of Christmas train candles I’ve had for more than ten years. “This was one of my favorites,” I added a few minutes later as a blue-painted balsa-wood sailfish ornament disintegrated in my hands. I’ve been using the same tubs to store these ornaments since we moved into this house eight years ago, and this has never happened. I’m not even sure how it DID happen, as not all of the ornaments in the box showed signs of moisture (though all had that ghastly stench). I called my mother, who was busy sewing, but took time to console me. All told, I lost about ten ornaments, a few of which were never favorites, and a few of which were. One of them was a glass geisha that had shattered into pieces; another, the worst loss, was a giant starfish (sorry, sea star) that was a reminder of a trip to Carmel or Monterey (it was decorated with a tiny wreath and bits of pine). It may not seem like a big loss, but every ornament that had to go into the trash represented a memory, a moment, something I wanted to carry with me forever, and while the actual thoughts and images may be indelibly etched on my brain, without the ornaments to serve as keys, those etchings may as well be chalk drawings washed into the gutter by a heavy rain.